Melody is a bay Quarter Horse Mare. She is 22 years old this year. She knows a lot of tricks, such as rearing, bowing, saying Yes and No, picking up her feet while you stand on the opposite side (while you’re hoof picking,) standing on a pedestal, the Spanish Walk, and walking backward when you pull her by the tail. She’s done all levels of showing, jumping, western, sidesaddle, driving, parades, and has helped to teach Trick Training Clinics all over. Melody loves kids and has lots of fun in riding lessons. She is owned by Sarah. Honey is a Quarter Horse Palomino Mare. She’s used for lessons and has quickly become a farm favorite. She is owned by Sarah. Sidney is a 17 year-old Palomino gelding. He is extremely dappled and has a pleasant personality. Sid is owned by Nancy. Twist is a 19 year-old Registered Pinto Tovero Gelding. He has one brown eye and one blue eye. He is owned by Sarah F.
Applejack is an April 13, 2014 dunalino rescue colt. His favorite activities are standing on the pedestal, lunging, and doing anything for treats. He is owned by Sarah. Atlas is a three year old bay Quarter Horse cross who came from the same rescue (Sandstone Farm’s Rescue Efforts/SSFRE) as Applejack. We boarded him for a short time when he was young, he went to one owner, and then he was reclaimed by SSFRE and re-sold to one of my lesson students and her family. Atlas is owned by Stephanie. Patriot is a three year old Pinto gelding owned by Joelynn. Cupcake is a 23 year-old Alternative-Fact Teacup Belgian*. He’s owned by Firefly Farm. *Real Fact: Teacup Belgians don’t actually exist. We created a breed for Cupcake so he can feel special. We have no background on his lineage, so we don’t know his breed. He’s 95% mischief and 100% cute, though. Ranger is a 14 year old Haflinger who is perfect in almost every way. He’s owned by Bonnie B.
Bandit is a black-and-white female Border Collie. She is owned by Sarah. Bubbles is a Border Collie puppy who loves people. We have quite a number of cats. Smoky Joe is a cat who came, literally, from Hell–Hell, Michigan. He used to belong to a dear friend named Angelo, but when Angelo moved to Montana, Smoky Joe was left behind. Smoky Joe came from the Hell Creek Ranch to Firefly Farm. 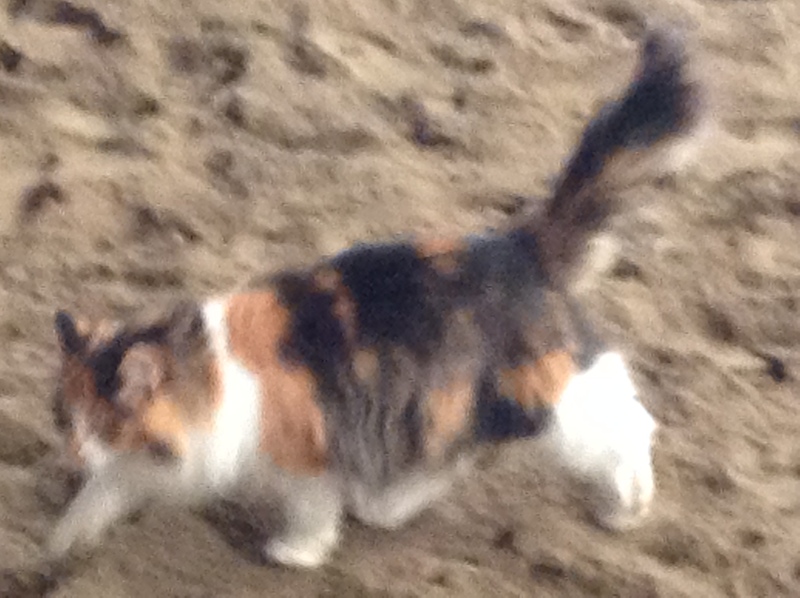 Tippy is a tortiseshell cat who loves to hunt. She’s owned by Firefly Farm. Yoda was an adorable orange male cat owned by Firefly Farm. He is the lovely orange cat on the left. Sadly, he met an untimely death in September 2012. 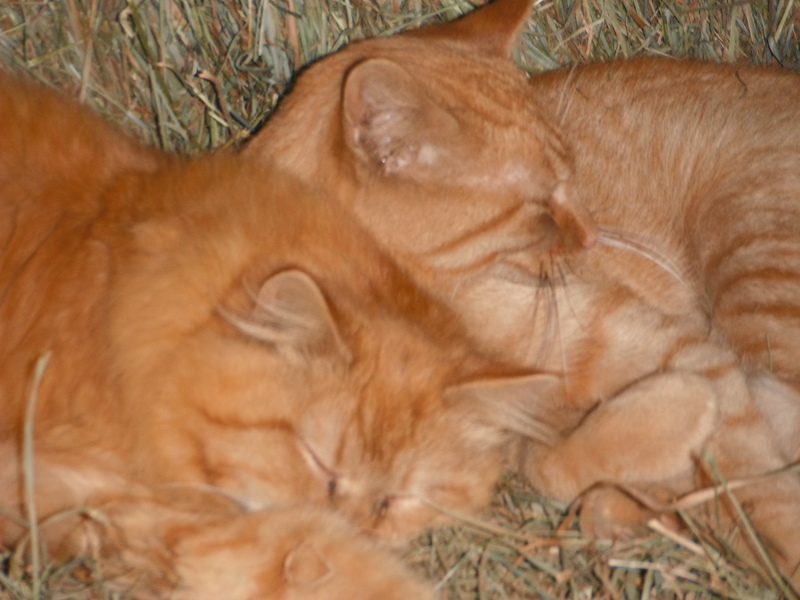 Rue is a recent addition to Firefly Farm–she is a wonderful female short haired orange cat who adored Yoda. 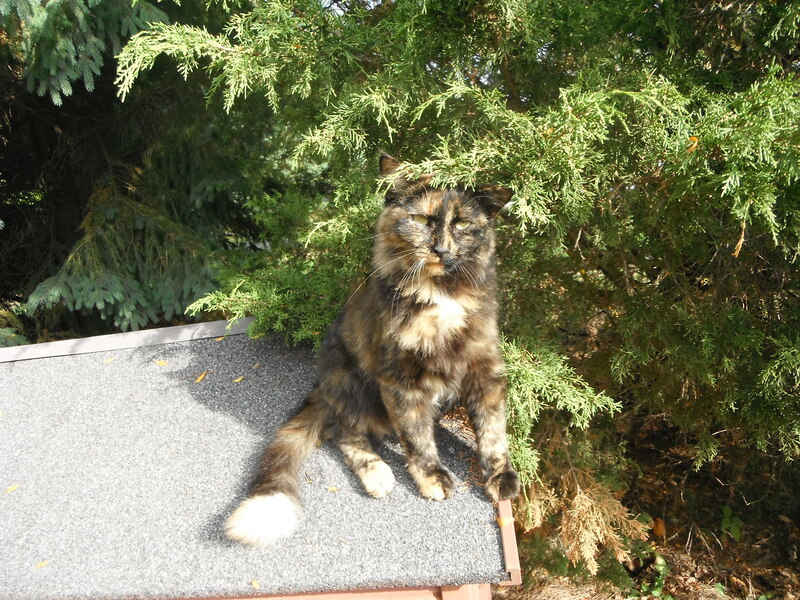 Diva is an adorable female tortie cat. She is brown and black with orange tips on her toes. She frequently will climb people, assuming they are trees. Owned by Firefly Farm. Hannah is a female black short haired cat. Muffin is a female calico cat. Itchy is a male long hair striped cat. We have a large number of chickens, ducks, turkeys, and a single guinea fowl. We also have many chickens and roosters. Our buns are never, ever put in the oven. We do, however, have the best buns in town. Our first bun’s name is Sir Hops a Lot Freight Train the First. We brought Sir Hops a Lot Freight Train the First, then known as Nameless the male Mini-Rex, to the Meijer Garden event in hopes someone would help us out with a name. We weren’t disappointed. The problem arose when The Husband and Sarah fought over who would win the naming contest. She liked Sir Hops a Lot. He liked Freight Train. Who won? The bun. The Bun won. Because of all the animals in the barn, he has the longest name. The next bun is Silky Cocoa Creme McGuire. He was a gift from Copper Penny Stables. He’s a Harlequin Mini-Rex. Where are the pictures of the beautiful kitties? Looks like you’re pretty busy! I sure know what’s that like, but now I’ve thinned the herd and taking a break for the first time in 15 years. Love the pasture, something a desert dweller doesn’t see much! We must add the chickens 🙂 Mostly because I adore “leg eater” and the guinea hen.